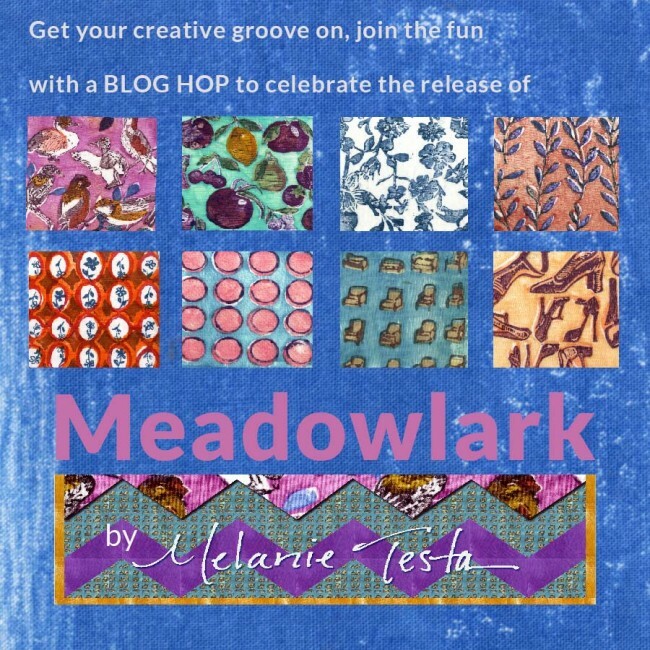 Twisted Sister: Meadowlark Blog Hop and Give-Away! Meadowlark Blog Hop and Give-Away! The first project was a tea cozy. I absolutely love her fabrics, especially the dots, no surprise there. I love the vine that adds a gentle flow. I used the selvage with Melly's name on it for the lower portion. It was just fun to be able to document it. Don't you just love the colors? Here's the line up of great artists who are sharing their work with you on the Meadowlark journey! Enjoy! Give Away ALERT! A "fat stack" of 10" squares from each fabric in Melly's new Meadowlark line is my give-away on this post. The fabric is not even out in stores, yet, so you could have a pretty cool bundle. Leave positive comments about the line and/or my projects, and I will select a winner through the random selector, deadline is Monday, June 9th at 9pm Pacific Standard Time. Whoohoo! . Random Number Generator - Winner is the 3rd comment - Allison! As this blog hop continues I find that my choices in this line are changing too. The dots are becoming my favorite and I love the combinations you used. Just fabulous! The the prints and colours in this line are fantastic. I love them more and more as the hop continues. I really like your vase, it's such a fun idea and is very visually striking for both shape and fabric. The dress wall quilt is just so cute! The colors and prints are just perfect for it. What fun! I am loving all the different projects made with these fabrics but so far yours are pretty unique! The fabrics all work together so well. This project is so cute, I would love to try it! I also love the dots and vine fabrics, and that tea cosy is so, so cute! Nice to use the selvedge to document your project. The fabrics are yummy and the projects show them off! Nice! They are all beautiful projects. I loved seeing them. Perfect for Melly's lovely fabrics! Thanks for sharing! So pretty! Love that vine fabric and the birdies! I love the dots - I'd love a dotty shirt!!! I really like your wall dress quilt! great use of those beautiful fabrics! These fabrics look like they could be used for so many things. I love your vases! I especially like the dress,and the vase is way cool! Just really am enjoying all the different uses of Melly's fabrics by each of you..fun? I absolutely cannot wait to get some of Melly's fabric. I am with you on the dots and vines. They are so Melly! As are the chair and birds, what would be a fabric line of her's without those ingredients? LOL! Love the vase and the dress is fabulous with those cut outs. You always amaze me. Your vases are very cool, especially with the fabric. I love what you did with the fabric, beautiful and fun fabrics to do art pieces with. I was really looking forward to your stop on the hop, because I knew your projects would be wonderful! I love the arty vase and the fun dress. And the vine, as you pointed out, makes the tea cozy so beautiful. Awesome fabric, awesome designs! Thanks for sharing. i love the variation of color in the dot fabric. Fun and funky with the lovely menopausal mauve. Love it. I Think the fabric and your creativity are great! Hi Jamie... Melly has many terrific friends and you are one of the best - the special designs you created for her booth at Market are wonderful! The Dress is my favourite adn is a signature piece that will carry on for years! The vase is standing tall and is a design you could y=use anywhere! The tea cozy... calls you to just take a break and enjoy the fabric! Great job. Can't wait to see the fabric in the shops! What a fun & creative new line of fabrics! The dots and vines are my favorites - I'd love to create with with them! Great dots, vines, colors - and I love the hem on the dress, that works so well, but the vase is my favorite. You and Melanie have both done a great job, as if that's news. Your cute dress Wallhanging would look great in my granddaughters' room. I love the polka dots and the colors of this line. Thanks for sharing and for the giveaway. I love your vase! All very imaginative use of Melanies lovely fabric. I love the colors of the fabric! Your works of art make them really shine. Cute dress wall hanging and interesting vase. Melly's fabric line is sew cute and fun! As usual, I love the works of art you have created! I have loved polka dots since I was little. Your creativity is beyond....that dress, well, what can I say. Selvages are pieces of art on their own and I love what you did with it. Thanks for the chance to win this beautiful fabric. Love your works of art. These lovely fabrics offer so many possibilities! I never thought to make a 3d object like a vase by quilting! So clever and artistic! The polka dot fabric is gorgeous! I really love the free form vase! thank you for the lovely giveaway - beautiful fabric! Jamie, I love your projects, especially the vase. I love the dots too. Thanks for sharing. Melanie Testa is an amazing strong brave woman. Her line of fabrics are beautiful! I would love to win a stack of them! Love, love the sweet dress.This line of fabrics is exciting. I am inspired. Oh Jamie, I love your projects with this fabric. How fun and pretty the vines and dots look! And I love the little dress quilt! The fabrics and projects are perfect together. I love the colors of the fabrics! That little dress quilt is just adorable! I think it's a perfect project for a new week once coming soon! Would look great in her room! Thanks for the chance to win! The dress quilt is great. Love the fabric. Very interesting piece. I like how it looks like it is painted on the wall. All of your projects are beautiful! I especially love to make tea cozies. Thanks! I've always loved your work! This fabric just makes me happy! Lovely colors and fabulous designs. Oooohhh! I love your tea cozy and the especially the fabric you chose.... Beautiful!!! I love the colours in this fabric. So wonderful! Your ideas for using the fabric were very creative. I love the tea cozy best. You used my favorite fabric of the line to make the display objects, Jamie. I really like those selvages! I hope they're part of the giveaway, hehehe. The more I see of these fabrics, the more I like the colors. What a clever use of the selvages. The fabric line is so beautiful I can see why you used it all. Melly does good work; it was interesting to see you working with it...different than your usual stuff, but still with your style showing through. What fun fabric! Thanks for the giveaway opportunity. I like your dress wall quilt! I think the fabric with dots is the best!